Once, a long, long time ago there was a queen who saved her people. 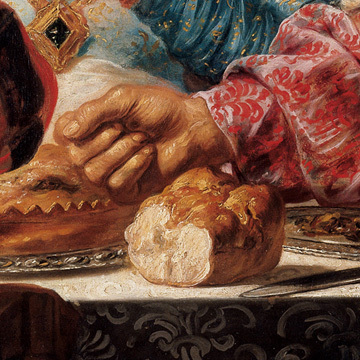 This painting is called The Feast of Esther. The story of Esther is told in the “Book of Esther” from the Old Testament in the Christian Bible. In the Hebrew Bible, the “Book of Esther” is in the third section called the Ketuvim or “writings” and is read on festivals or commemorative days of the Jewish year. Do you know who Esther was? 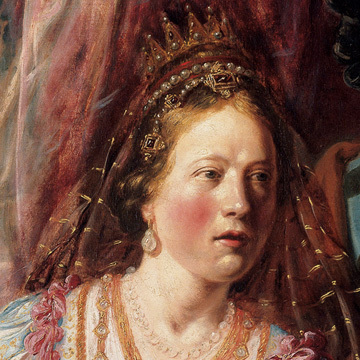 Esther was a Jewish woman who married the king of Persia. The king’s name was Ahasuerus. Which man is the king? The man on the right is the king. How can you tell? You can tell from his jewels, fur cape, silk clothing and crown. Who is the man on the left? He is Haman, the king’s evil minister. What does Haman do that is evil? Haman tricks Ahasuerus into letting him have all the Jews of the Persian Empire killed, because he thinks one Jew, Mordecai, failed to show him the proper respect. Mordecai was a close relative of Esther’s. Ahasuerus doesn’t know his wife, Esther, is Jewish and that her life and the lives of her people are in danger. Haman orders lots to be drawn to determine the day on which his plot to massacre all the Jews is to be carried out, but Esther quickly comes up with a plan to save herself and her people. She is forbidden to speak to the king in private, so she invites the king and his minister to a banquet and at risk to her own life tells the king about Haman’s treachery against her people. Here we have a story told through emotion and gesture. We see Esther at the banquet. At risk to her own life she is telling her husband, the king, about Haman’s plot to massacre all the Jews. Look how she is pointing at Haman. How does the king react to this news? He is furious! How do we know the king is furious? Look at the expression on his face. Now look at his hands. Describe his hands. His hands are clenched. He is shaking his fists violently in the air. Now look at Haman. How does Haman react? Look at his face. He has his right hand to his face. He is shocked and cowers at the king’s wrath. How does the use of light and shadow in the painting add to its drama and focus our attention? Esther and Ahasuerus are in the light. The light tells us that Esther has uncovered Haman’s plot and the lives of herself and her people will be saved. Haman, on the contrary, is in the shadows. There are consequences to Haman for his actions. Haman is alone and vulnerable and will be punished for his evil deeds! Would you like to see The Feast of Esther in person? All you have to do is visit the North Carolina Museum of Art in Raleigh, North Carolina. 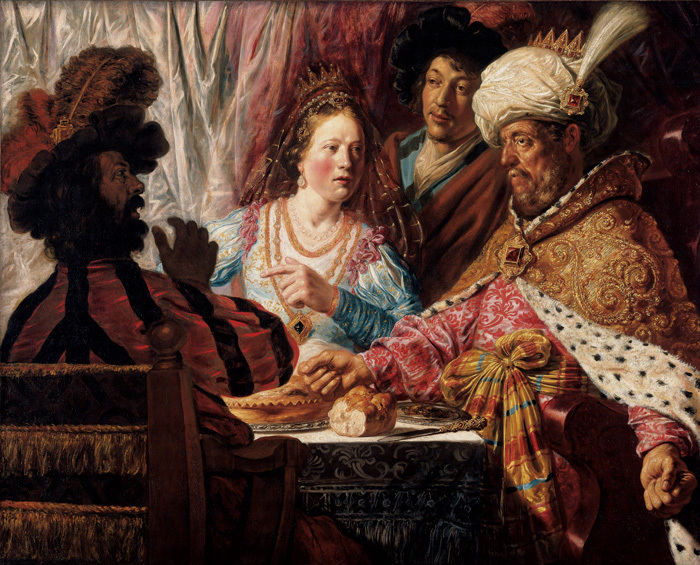 The Feast of Esther is in the European galleries at the museum. Or perhaps you would like a tour. Tours of the collection are given daily, except for Monday when the museum is closed to the public. If you prefer, you can contact the museum ahead of time and arrange for you and your friends to have a private tour. I’m sure a docent at the museum would be happy to show you and your friends The Feast of Esther and many other works of art. Whether you visit the museum on your own or have a tour with a docent, it will be well worth your time!